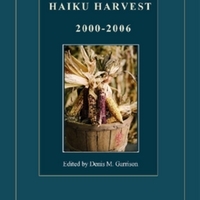 HAIKU HARVEST : 2000 – 2006,edited by Denis M.Garrison, is a compilation of the eleven issues of Haiku Harvest : Journal of Haiku in English, plus two issues of Haiku Noir and one issue of Ku Nouveau, both of which were incorporated into Haiku Harvest. Ku Nouveau reprinted with the permission of Co-Editor, John E. Carley of England. Garrison described the journal this way: "HAIKU HARVEST Journal of Haiku in English is dedicated to publishing and promoting haiku, both in the western tradition of classical haiku and in all related forms. We give generous space to poets so they can demonstrate the range of their haiku and we promote innovative ku by providing a showcase for poetry in new forms that are serious attempts to assimilate the haiku tradition in forms within the English poetic tradition." The cover photograph is in the public domain and is used courtesy of the U.S. Department of Agriculture. The black and white version of Dt. Angelee Deodhar’s color illustration in Vol. 2, No. 3, of the poem, “Light,” by Rakesh Biswas on page 107 used by permission of Dr. Angelee Deodhar. Vol. 5, No. 1 “sand flats at low tide” haiga [p. 240] photograph by National Oceanic and Atmospheric Administration; in the public domain. Vol. 6., No. 1 back cover haiga “the rising fog” [p. 451] and the two haiga, “sunburst” [p. 336] and “silence” [p. 349], included in the text are by Minerva Bloom, Fort Lauderdale, Florida, USA. All rights reserved. This journal compilation is republished here with the kind permission of the editor. ,” The Haiku Foundation Digital Library, accessed April 25, 2019, http://www.thehaikufoundation.org/omeka/items/show/349.